Q: Can we convert facebook into a global coop? A: WHY should we? “Seems like Facebook is going downhill for here. Perhaps opportunity to convert it into a global coop?” When I saw this question asked online, I couldn’t help but repeat asking how to convert Facebook, Twitter and similar platforms into a global coop is not the right question. The right question is: WHY should anyone do such a thing? What good would it make? Many of the problems created by Facebook, Twitter etc… are created EXACTLY by the fact that they are global platforms. Replacing them with more of the same broken architecture, just with “a global coop” instead of a global corporation as owner will NOT solve anything substantial. It doesn’t make any sense to look for a solution in that direction. Further reading, a.k.a: Platforms? 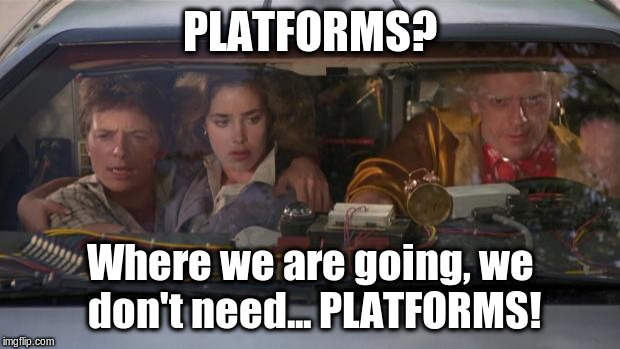 Where we are going we don’t need “platforms”! You can't solve problems created by platforms with OTHER platforms. Most discussions about “how to replace Facebook, Google and friends” include blockchain, at some point. Should they? Blockchain is serious stuff with great potential, but also (together with IoT, of course) burdened with the greatest amount of embarrassing hype I’ve seen since the dotcom circus ~20 years ago. Everybody who hasn’t slept enough for a long time, or wants to make some quick buck is yelling “blockchain”, to the extent that even crap like “blockchain for sexual consent” makes “business” news. So don’t try to force blockhain into anything you have around. Start from actual problems, imagine concrete solutions to them, and after that ask yourself how adding a blockchain to such solutions could concretely improve them.